All transactions are safe and secure with a reliable history in online purchasing behind each of our associates. 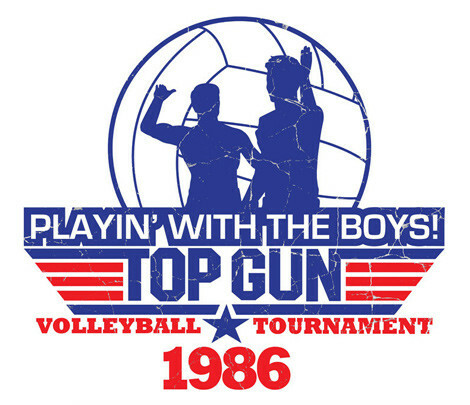 Buy the Top Gun Volleyball t-shirt to own Top Gun clothing and merchandise. Wear this Top Gun Volleyball design when your "playing with the boys" or hanging out with the girls. The basic Top Gun logo has been modified to commemorate the movie's classic volleyball scene featuring everyone's favorite ace pilot, Lt. Pete "Maverick" Mitchell (Tom Cruise). If you're looking for a unique movie related gift, this Top Gun tee is a great choice. To pull off the complete costume effect, wear it with a pair of stylish aviator Top Gun sunglasses or pair it with the officially licensed Top Gun Maverick t-shirt below that features the name Maverick written in white font across the back. In addition to the Top Gun Volleyball tee above, browse the Top Gun Clothing Gallery for more apparel like men's and women's clothes, kids shirts or hoodies.